We have the complete line of the modern Gonset ham gear including the popular Communicators, Sidewinders, and the respective linears. 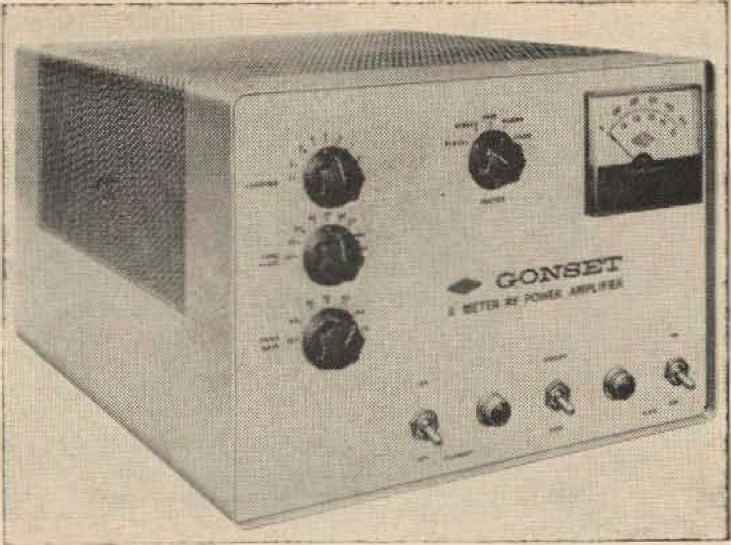 Remember that Gonset makes the only 2-meter sideband transceiver and that this unit was designed to operate in either a car or at home. 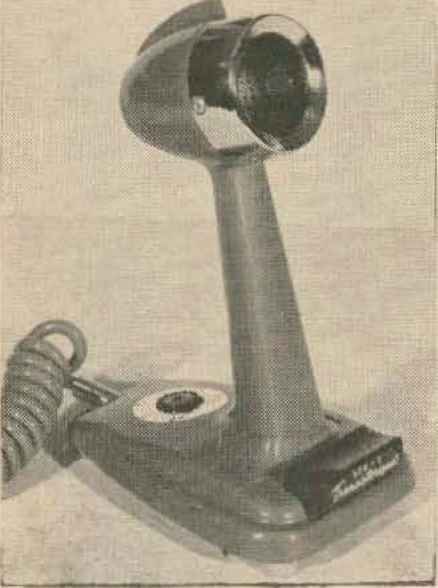 The model G-50 has enjoyed an enviable reputation for years as an advanced type Civilian Defense communicator. It is really a complete station with 48 watt input, a dual conversion receiver and power supply all in one package. The G-50 covers the range of 50-54 mcs. All you need do is plug in the power, microphone, and connect up the antenna and you can thrill to the excitement of 6-meter DX. tion and 8 amperes in DC transmit position. When used on AC, it draws only 100 watts. The rating of the 2-meter Sidewinder is 20 watts PEP, 6 watts for AM and 20 watts for C\V. The sensitivity is 0.5 microvolt for db signal plus noise to noise ratio while the bandpass is 3.1 kc from a specially designed crystal filter* The unwanted products are down 50 db. The Sidewinder sells by itself for $399.50. Its AC supply is $73.50 and its companion DC supply, $79.50. We also carry in stock the 2-meter linear amplifier model 903A which is rated at 500 watts PEP or 300 watts on AM peaked. It requires only 5 watts of excitation and works into a 50-ohm nominal output. Its weight is 60#. Its dimensions are 8W high,, 12%" wide, 17^q" deep. These units will cover adjacent MARS frequencies as well as the entire 2-meter band. They employ a 4X150A tetrode in an ABi configuration and require only 5 watts of drive. The 6-meter Sidewinder is an original design and covers the range of 49.975 to 54.025 mc. Unwanted productions are down a minimum of 40 db. This transmitter has the same power rating as its companion Sidewinder and the receiver is likewise similar in sensitivity to its 2-meter brother. 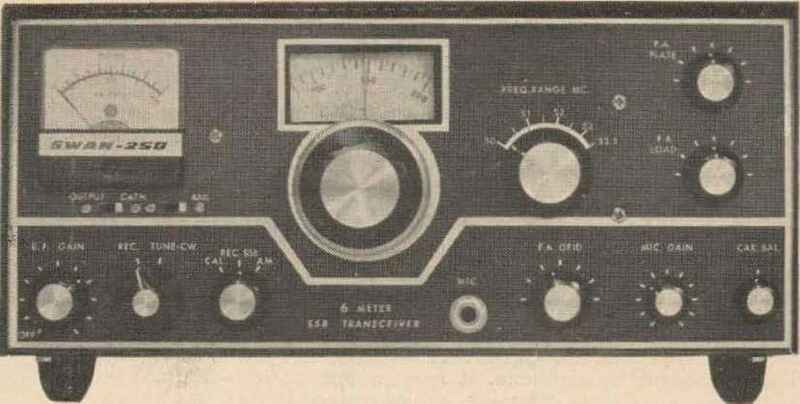 The model 910A transceiver measures wide, high, 9" deep. It is priced at $399.50. The DC and AC supplies are in physically similar cabinets but only deep. The weight of the transceiver is 11 # and of each supply 14#. The companion 500 watt linear amplifier is Gonset's 913A and is priced at $339. Get with it, fellows! Get Swan! 1 have written a great deal about Swan in the past year, my ads having appeared in 73 Magazine, and other magazines as well. Suffice to say that I consider Swan to be the overwhelming choice in America today for small transceivers More Swans have been sold than all of the other brands put together and this is not an exaggeration. The fundamental reason why America has taken to Swan is the fact that you get the most for your money in this set—the maximum frequency coverage, the most power, and the greatest choice of options on accessories. Swan is an attractive piece and Swan sounds good when you listen to it on the air. We carry the complete Swan line, and because we keep in close touch with the factory, we can introduce new models to the public before other distributors can. For example, we have sold more of the Model 250 6-meter sideband transceivers than any other dealer as of October 1966, and we will shortly have the new 6-meter kilowatt linear with 2000 watts nf PEP. This will sell at §543. with tubes. The largest seller continues to be the model ■ !50, This is a 5-band complete-coverage transceiver providing AM, CWt and sideband operation. Its companion is the Model 400, Let me describe the difference between the two. The 350, with an appropriate power supply is a complete package requiring only a microphone and a suitable load. The Model 400 requires an external VFO in addition to a power supply, microphone and load. In other words, the 350 has a VFO; the 400 does not. The 350 was designed to be a basic set, providing the means for the owner to add the accessories of his choice. For example, w ith the 350 you can purchase a calibrator at $19,50. This will enable you to have lOOkc markers throughout the set's spectrum and it is easy to install—takes only about an hour. If you are one of those rare fellows who wants to defy convention and operate on the opposite sideband from most of the gang, the other sideband kit is available for only $i8. Ordinarily, of course, the 350 conies through with lower sideband on 80 and 40, and upper sideband on 20t IB, and 10. By contrast, the Model 100 includes the calibrator and the opposite sideband and a built-in speaker. You might think of the 400 as being a deluxe version of the 350. The price of the 350 and the 400 is the same—$420 each. 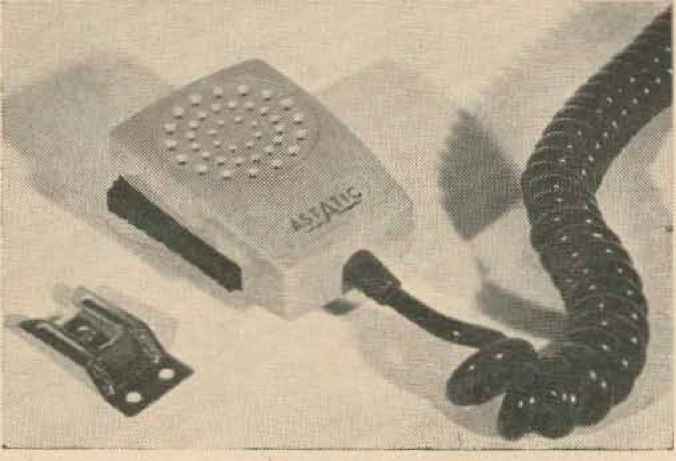 Oh yes, I forgot a most important part—the transistorized VOX, The model 400 includes the VOX, but it is an accessory for the 350 and costs $35. If you want to do it up brown and get the 400, there is a choice of three oscillators or VFO\s. You can get the Model 410 which is essentially the same VFO as is normally found in the 350, This costs $95 but, unlike the 350, it provides for 8 ranges of 500 kc each with calibration better than 5kc on each band. The second is a crystal-controlled J?ARS oscillator which will enable either the 350 or the 400 to reach any frequency from 3 to 30 megacycles, and is available for only $45, less crystals- The third oscillator is the mobile model 406B selling at $75. This, in reality, is a control box and VFO combination. When used with the 400, it permits operating the transceiver in the trunk of the car and the controls themselves can be conveniently mounted underneath the dash. It is very small and compact. It includes an RF gain control, a jack for the microphone, etc. Another accessory is the remote control kit for trunk mounting of either transceiver. This is only $25. 117XC, sells for $95, It includes a small speaker, a phone jack, and a neon indicating light, and, of course, it matches the style and dimensions of the 350 and 400. It may be used with either the 350 or the 400 and, by the way, many of you hams have learned to your disappointment that you cannot easily make a supply to do this specific job. The reason why the Swan supply is unique is that it has the ability to deliver a hundred volts of bias at 100 milliamperes. Additionally, it provides 12 V DC at 250 mils for operating relays and, of course, the conventional 800V and 300V, But don't let me stop here. The Swan concept on power supply engineering makes it possible for you to use this same supply if you want to operate mobile. All you need do is to purchase their Model 14X for 12V grounded negative applications or their Model 14XP for grounded positive cars, and then plug this module into the back of the standard power supply. Some of you will only want to operate mobile, especially those who are on the road all of the time. Swan has the answer: Don't buy their console with the speaker and phone jack. 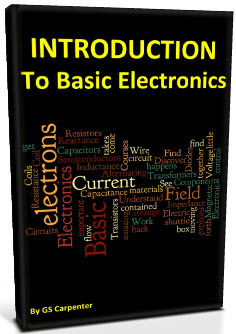 Just buy the DC module and the basic AC supply. This is their model 14-117 and costs only $130, and, if you start out like this and later wish to convert, you can bny the matching console for only $20. I think, when you evaluate the cost of other manufacturers' products, you will find it less expensive to put the Swan in the car to start with than other brands and certainly far less expensive to get a combination supply. 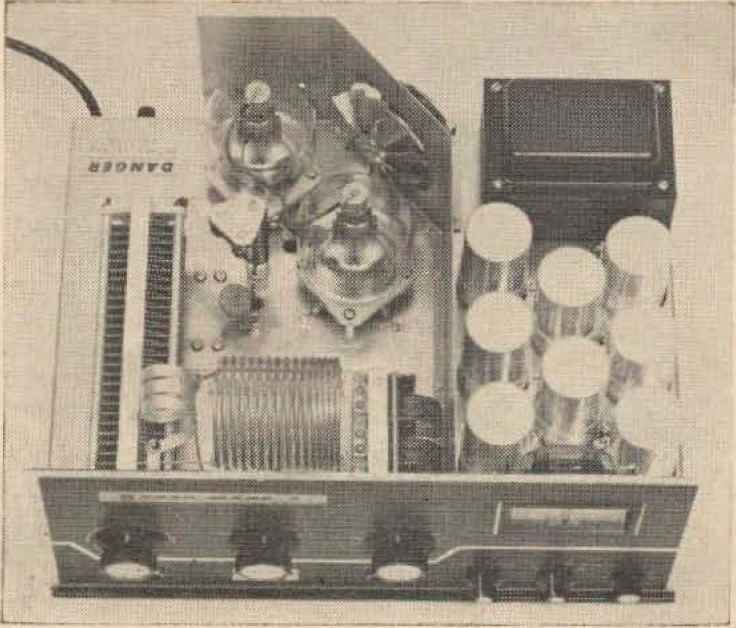 Swan s Mark I linear complete with tubes is $543- It is styled as per the accompanying photograph to match the appearance of their transceivers. The unit will operate cool with a pair of 3-400Z*s and produce a maximum rating of 2000 watts PEP input. In other words, you can run a thousand watts of DC input. This is a modern air-cooled unit with solid state rectifiers engineered as a mate to the models 350 and 400. 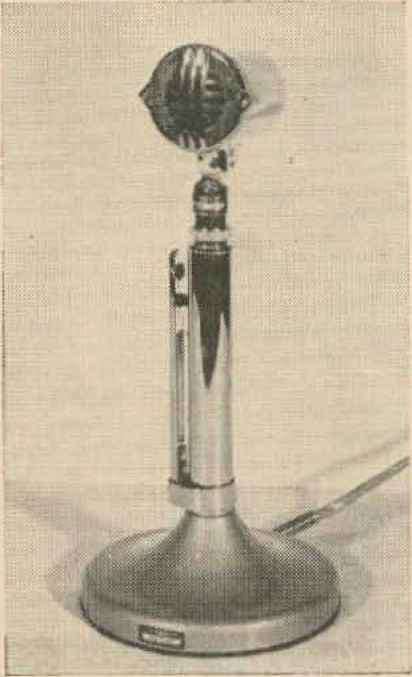 The illustration on this page discloses the most popular microphone that we have found for amateur application. The D-104 made by Astatic has been the ham's friend for better than 30 years, it was really the first piezo crystal microphone available and to this day, it is clear, crisp and of highly intelligible quality. It is easily recognized at thousands of amateur installations throughout the world. One feature of the D-104, aside from its impressive chrome-plated appearance, is its relatively high output. This means that the microphone need not be talked into closely, with the accompanying raspiness of your breath made evident to the person you are talking to. 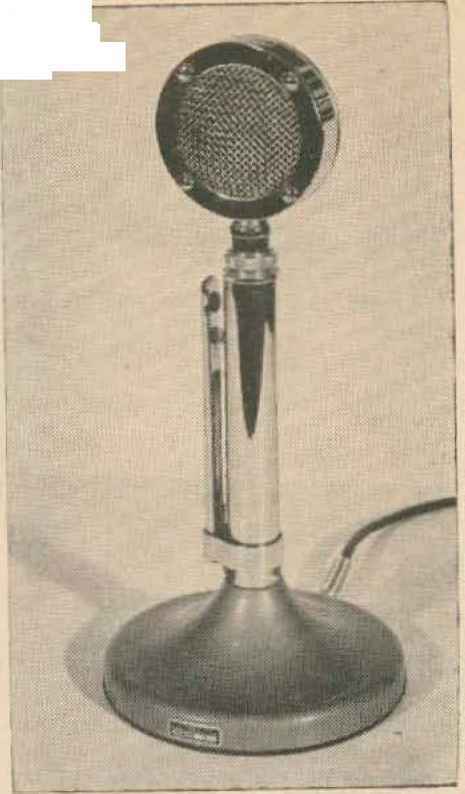 Speaking in a normal conversational voice, between 6 and 12 inches away from the microphone, this D-104 will provide the output equal to many foreign imports which require close talking. A thoroughly satisfactory microphone for mobile application is Astáticas model 531 mobile mike which we sell for $7.50, This is a high performance ceramic microphone with a tailored response for maximum clarity and intelligibility for speech frequencies. It has a high impact plastic housing with a 3-conductor shielded coiled cable 5' long. When a ham comes to us and wants a practical microphone for mobile operation, either sideband or AM, we recommend and sell many of these 531's. Loren Parks is a big: guy in more ways than size. Having worked under Dr. Schmidt of Schmidt trigger fame, knows his electronics and besides that, he's an avid ham. K7AAD almost single-handed has kept the VHFer Magazine going—and so he knows his ham friends as we]J, When, five years ago, Loren felt the need of a superior VHP converter, he did the obvious thing—he built his own; and when his friends heard this converter work, they wanted one like his. K7AAD and W7UHF got together and started building these artistic little black boxes in Loren's garage. The fact that Loren has a Tektronix background meant that he was most particular about quality. Word spread and soon Parks Electronics was on the way. Today it can truly be said that his VHF converters span the globe and provide the most outstanding performance available. Each converter is individually tested for gain, width, and noise figure. Each has its own self-contained power supply—even the latest transistorized 432-3 model.